Personal jurisdiction usually focuses on the rights of the defendant. That is because a plaintiff implicitly consents to personal jurisdiction in the court where the plaintiff chooses to file. But what if the defendant seeks to transfer venue to a court in a state in which the plaintiff has no contacts and never consented to personal jurisdiction? Lower courts operate on the assumption that, in both ordinary venue-transfer cases under 28 U.S.C. § 1404(a) and multidistrict-litigation cases under § 1407(a), personal-jurisdiction concerns for plaintiffs simply do not apply. I contest that assumption. 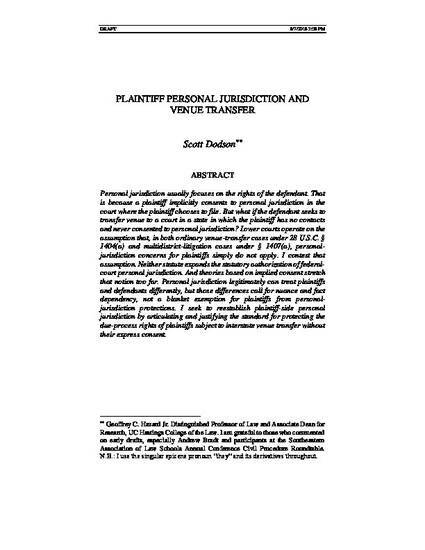 Neither statute expands the statutory authorization of federal-court personal jurisdiction. And theories based on implied consent stretch that notion too far. Personal jurisdiction legitimately can treat plaintiffs and defendants differently, but those differences call for nuance and fact dependency, not a blanket exemption for plaintiffs from personal-jurisdiction protections. I seek to reestablish plaintiff-side personal jurisdiction by articulating and justifying the standard for protecting the due-process rights of plaintiffs subject to interstate venue transfer without their express consent.